Mitochondria is the plural for Mitochondrion. Aerobic metabolism provides nearly all the fuel we use to run our bodies. We can only live for a few minutes without the constant energy supply derived from aerobic respiration. It is why we have to breathe! Endurance sport performance places a premium on aerobic respiration and its ability to convert the energy in food into a form our body can use. It may not be intuitively obvious, but even maximal efforts as short as seventy-five seconds are primarily powered by aerobic energy systems (Gastin, 2001). As a result, a primary goal of any endurance sport training program involves the building of one’s aerobic engine. On the most basic level, mitochondria are our aerobic engines. Mitochondria are the microscopic components of cells where aerobic respiration occurs. Aerobic respiration is nothing more than the use of oxygen’s affinity for electrons to drive the chemical conversion of the energy stored in organic molecules into adenosine triphosphate (ATP), which is the form of energy our cell’s molecular machinery needs to run our bodies. Aerobic respiration is not the only chemical pathway for ATP production, but it is in charge of producing the vast majority of the ATP necessary for our life-sustaining processes and the performance of endurance exercise. In this article, I’ll take a basic look at mitochondria, the signaling which induces their biogenesis, and the practical training application of this information to cycling performance. So what are these mitochondria that take care of our needs for aerobic respiration? They are a bacterium sized organelle with its own genetic material found within the cytoplasm of our cells. The endosymbiotic theory states that mitochondria were likely at one point an independent aerobic bacterium which found a home within a larger eukaryotic cell (Alberts et al., 2002). This partnership was then favored by natural selection and resulted in a proliferation of larger organisms which required and could utilize the metabolic power of aerobic respiration. This symbiotic relationship has evolved to such an extent and economized so much that some of the mitochondrial genetic material has been transferred to our nuclear genome, and the function of both genomes have become greatly interdependent (Virbasius, 1994). As an aside, we inherit our mitochondria and our mitochondrial DNA from our mothers due to their residence in the cytoplasm. Mitochondria have two membranes; an outer membrane and an inner membrane. The inner membrane is folded extensively into structures called cristae, which create a large surface area for the chemistry responsible for aerobic respiration. This chemistry occurs on both sides of, and within the inner mitochondrial membrane. 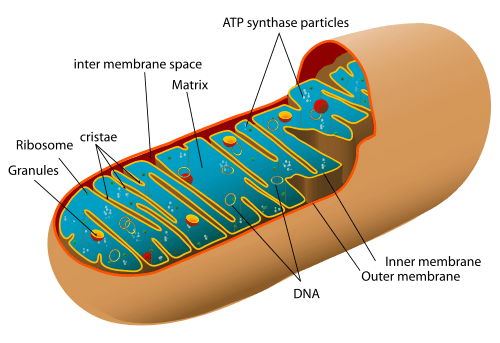 ATP is eventually produced on the inner surface of this membrane and is then sent outside of the mitochondria to fuel the cell’s energy demands. Endurance exercise is a strong stimulus for the proliferation of mitochondrial enzymes. The increase in mitochondrial density is associated with an increase in the duration one can perform endurance exercise and the ability to spare total body glycogen stores (Fittz et al., 1975). Generally, more lipids are used to generate ATP as a result of the increased mitochondrial density in response to exercise. A large body of research suggests that the enhancement of mitochondrial density in skeletal muscle is a key component in the development of performance in endurance sport. In a general sense, building more mitochondria allows an athlete to function closer to their potential. 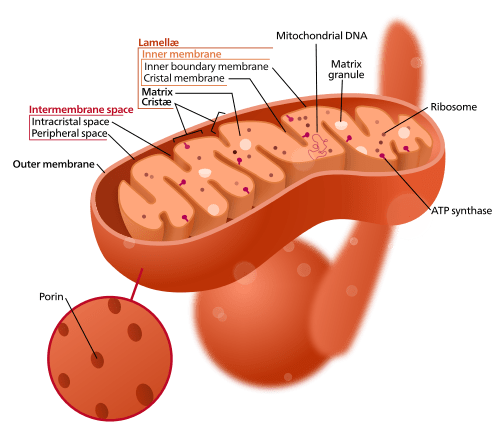 How does one ramp up mitochondrial density? First, let’s take a quick look at what tells mitochondria to up-regulate. Recent research has begun to identify the signaling that initiates the chains of enzymatic reactions which turn on the combination of nuclear and mitochondrial genes responsible for mitochondrial biogenesis. It appears that at least two significant signals exist, and that potentially these signals work together. Cytosolic calcium concentrations are one of these signals. Research suggests that simply an increase in the concentration of calcium within the cells of skeletal muscle, something which happens with each muscle contraction, is capable of inducing mitochondrial protein synthesis. This increase in calcium is suggested to activate an enzyme called calcium-calmodulin kinase (CAMK) which then plays a role in the expression of mitochondrial biogenesis associated proteins such as PGC-1, NRF-1, NRF-2, and mtTFA (Ojuka et al., 2003). However, it appears that not all of the proteins necessary for mitochondrial biogenesis are activated by calcium signaling alone (Devin, 2004). The other apparently essential and dominant signal necessary to incur mitochondrial biogenesis appears to be a reduction in cellular concentrations of high energy phosphates such as ATP and phosphocreatine. Decreases in the concentrations of these molecules are generally associated with the inability of aerobic respiration to maintain them during high intensity exercise. Research in this area suggests that a reduction in the cellular concentrations of these high energy phosphates activates an enzyme called 5’-AMP activated protein kinase (AMPK), which is closely related to CAMK. Activation of this enzyme apparently plays a critical role in mitochondrial biogenesis (Winder et al., 2000; Zong et al., 2002). Interestingly, this enzyme also plays a role in the genetic expression of vascular endothelial growth factor (Ouchi et al., 2005), a key component in the induction of angiogenesis or the development of the new blood vessels needed to supply mitochondria with oxygen. The current knowledge regarding the genetic signaling necessary for overall mitochondrial up-regulation suggests that it may be necessary for mitochondrial uncoupling to occur, or when ATP consumption outpaces ATP production during intense exercise (Devin, 2004). Research has also been done which investigated mitochondrial enzyme concentration responses to different exercise stimuli. It has been demonstrated that in all muscle fiber types, exercise durations longer than about sixty minutes at controlled intensities, do not result in significant, additional mitochondrial enzyme densities (Dudley et al., 1982). This research perhaps also supports the notion that calcium signaling has a limited role in the induction of mitochondrial biogenesis given the rapidly diminishing returns when muscle contractions are continued. Dudley et al. also demonstrated that very high exercise intensities (approaching and exceeding VO2max) performed as intervals with cumulative durations of less than thirty minutes per day increased mitochondrial enzymes similarly to longer durations at lower intensities in both slow twitch and fast twitch muscle. This result suggests that mitochondrial density adaptations can be achieved in a reasonably duration independent manner (Dudley et al., 1982). The overall higher mitochondrial densities associated with the higher intensities outlines the potential need for mitochondrial uncoupling and the AMPK signaling, at least beyond the completely untrained state. It is interesting to note that Dudley et al. also discussed in the cited research that a limiting factor in the slow twitch muscle fiber respiratory capacity development measured at the extremely high intensities tested was likely the mode of exercise and not the intensity of the exercise. The test subjects were running at very high speeds which required extreme muscle contraction velocities which may have been beyond the ability of the slow twitch fibers to produce sufficient tension. Therefore, the slow twitch fibers may not have been overloaded enough to fully adapt (Dudley et al., 1982). On a bicycle, muscle contraction speeds are essentially a non-factor due to the use of gears. Interestingly, research has also shown that extremely short but intense exercise bouts (~ 30 second all out sprints) can increase the respiratory capacity of whole muscle and overall endurance performance (Burgomaster et al., 2005). So what does this all mean in terms of practical application to the development of cycling training programs? First of all, it means that rides over an hour in duration will not necessarily improve mitochondrial density and the respiratory capacity of skeletal muscle. These generally lower intensity rides, which are often suggested to be an essential part of building one’s aerobic engine, are not inevitably more productive than an hour long ride at the same intensity. Intuitively, this does make some sense. If one can already meet the rate of ATP demand with aerobic respiration, as suggested by already having the ability to sustain such intensities for that long or longer, there is not likely to be much, if any, effective stimulus for mitochondrial development. Additionally, intensities approaching or exceeding VO2max, or in cycling power terms above approximately 95% of one’s 20 minute maximal power (20MP), appear to be required in order to elicit the largest concentrations of total mitochondrial enzymes. This is likely a combined result of additional motor-unit recruitment with increasing intensity and mitochondrial uncoupling in the progressively oxygen limited environment found when closing in on the limits of oxygen delivery. Aerobic metabolism of a variety of organic molecules is not up to the job of energy production, and more mitochondria are needed to fill the demands. In particular, long, exclusively easy rides do not appear to effectively promote mitochondrial development and/or bolster the size of one’s aerobic engine. The process of building a bigger aerobic engine appears to be skewed towards an accumulation of high intensity training over time. Eventually though, it is largely the ability to deliver oxygen to our mitochondria which limits the rate at which our mitochondria can generate ATP from the variety of organic molecules that can be oxidized. Without adequate oxygen, the chemical reactions involved in aerobic respiration are impaired. The primary reason our aerobic engines can only be so big is because our cardiac output and our blood’s oxygen carrying capacity can only be so good! Once one gets beyond engine size, there are other factors which can influence performance. One cannot expect to have reached their performance potential in extremely long endurance events on a diet of exclusively one hour rides with high intensity intervals. The targeting of an event’s expected, more specific demands, such as a combination of the total work and the distribution of that work, is likely to be of benefit. In at least the weeks leading up to target events, an additional 1-2 rides per week can augment the 20MP+ training discussed above. It may be that these days are combined with the 20MP+ work. For example, if one is targeting an event expected to require 4000kj’s, it would be wise to include some training in preparation for the event which approximates those demands, even if such training is not likely to be helpful in building a larger aerobic engine. The next time you are out there training, think about your mitochondria sucking up that oxygen and powering your body. They are your friends…diligently providing the matrix a portion of the enzymes responsible for the chemical reactions which power your muscles. It would also be a good idea to think about how to efficiently get more of them when trying to build your aerobic engine as big as it can be. Generally, you have to go hard to make them grow! The bigger the engine, the faster one can go! Train hard, rest hard, train hard again, and have fun along the way! Alberts, Bruce, Alexander Johnson, Julian Lewis, Martin Raff, Keith Roberts, and Peter Walter. (2002). Molecular Biology of the Cell (4th ed.). New York: Garland Science. Burgomaster, Kirsten A., Scott C. Hughes, George J.F. Heigenhauser, Suzanne N. Bradwell, and Martin J. Gibala. Six Sessions of Sprint Interval Training Increases Muscle Oxidative Potential and Cycle Endurance Capacity in Humans. J Appl Physiol. Jun; 98 (6): 1985-90. Devin, Anne and Michael Rigoulet. (2004). Regulation of Mitochondrial Biogenesis in Eukaryotic Cells. Toxicology Mechanisms and Methods. 14: 271-279. Dudley, G. A., W.M. Abraham, and R. L. Terjung. (1982). Influence of exercise intensity and duration on biochemical adaptations in skeletal muscle. J Appl Physiol. Oct; 53 (4):844-50. Fitts, R. H., F. W. Booth, W. W. Winder, and J. O. Holloszy. (1975). Skeletal Muscle Respiratory Capacity, Endurance, and Glycogen Utilization. Am J Physiol. 1975 Apr; 228 (4): 1029-33. Gastin, Paul B. (2001). Energy system interaction and relative contribution during maximal exercise. Sports Med. 2001;31(10):725-41. Ojuka, Edward O., Terry E. Jones, Dong-Ho Han, May Chen, and John O. Holloszy. (2003). Raising Ca2+ in L6 myotubes mimics effects of exercise on mitochondrial biogenesis in muscle. FASEB J. Apr; 17(6):675-81. Ouchi, Noriyuki, Rie Shibata, and Kenneth Walsh. (2005). AMP-activated protein kinase signaling stimulates VEGF expression and angiogenesis in skeletal muscle. Circulation Research. 96: 338-346. Virbasius, Joseph and Richard Scarpulla. (1994) Activation of the human mitochondrial transcription factor A gene by nuclear respiratory factors: a potential regulatory link between nuclear and mitochondrial gene expression in organelle biogenesis. Proc Natl Acad Sci U S A. 1994 Feb 15; 91(4):1309-13. Winder, W. W., B. F. Holmes, D. S. Rubink, E. B. Jensen, M. Chen, and J. O. Holloszy. (2000). Activation of AMP-activated protein kinase increases mitochondrial enzymes in skeletal muscle. J Appl Physiol. Jun; 88 (6): 2219-26. Zong, Haihong, Jian Ming Ren, Lawrence H. Young, Marc Pypaert, James Mu, Morris J. Birnbaum, and Gerald I. Shulman. (2002). AMP kinase is required for mitochondrial biogenesis in skeletal muscle in response to chronic energy deprivation. Proc Natl Acad Sci U S A. December 10; 99(25): 15983–15987. Kirk Willett, is a twenty-year+ participant in the sport of cycling who has competed in 17 different countries on 5 different continents. Originally from Pullman, Washington, his racing career has ranged from his roots as a Pacific Northwest junior and amateur competitor to time with the U.S. National Team and then on to professional competition as a member of the Mercury Cycling Team including events such as the Tour of Switzerland. He was also a director with the Mercury Cycling Team and then directed the Prime Alliance professional team full-time from 2001 through 2003. He has also been a coach and advisor to members of both the Mercury and Prime Alliance professional teams in addition to other Pacific Northwest athletes. Kirk is currently a medical student attending Oregon Health Sciences University building on his exercise science education from Washington State University. He resides in Portland, Oregon with his wife Tina and two sons. He is a strong advocate for clean, ethical sport and encourages all athletes to take the same pledge he did as a young amateur: “I will never participate in doping no matter what I stand to gain. Next Post Can mitochondria be inherited from paternal line?